Agate Basin Point From Southern Illinois. This Agate Basin point was found several years ago by Russell Fisher in St. Clair County, Illinois. The base is heavily ground and it's been extensively resharpened. 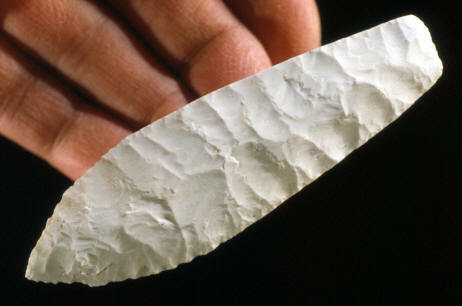 At one time it was apparently a fairly large spear point. This Agate Basin point is made of white Burlington chert and it measures 3 7/8 inches (9.8 cm) long. Agate Basin points were first named by Frank H H. Roberts Jr. after the Agate Basin site. The Agate Basin site is located on the border of eastern Wyoming and western South Dakota in Niobrara and Fall River Counties. Agate Basin points are lanceolate spear points that are found over a wide area of North American. They are found in most of the Midwestern and western states from Wyoming to Ohio and from Texas to Canada. Agate Basin points date to the Early Archaic period from 8500 to 8000 B.C.